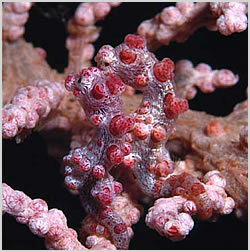 Situated off the north coast of Lembeh Island the submerged peaks here have a number of gorgonians that are home to pygmy seahorses. It is a little different to the rest of Lembeh's muck dive sites, this spot is more like a coral reef dive. Visibility is usually a bit better and there is a couple of swimthrough at about 25 meters which makes up the "Window". Snappers and jacks are often found hanging out here and the walls are lined with crinoids and featherstars.